Standing while presenting her life-giving breasts. 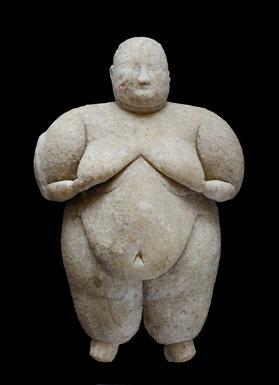 This recently unearthed figurine was found in Turkey at the neolithic site of Catalhoyuk in central Anatolia. Dating from 5500-8000 BC, she very much resembles the Granary Goddess found decades ago, who was seated on a throne flanked by leopards. She measures 6.7 inches and weighs 2.2 pounds. She joins our MA pose practice of reconnecting and sharing life-giving energies so needed in our world today. 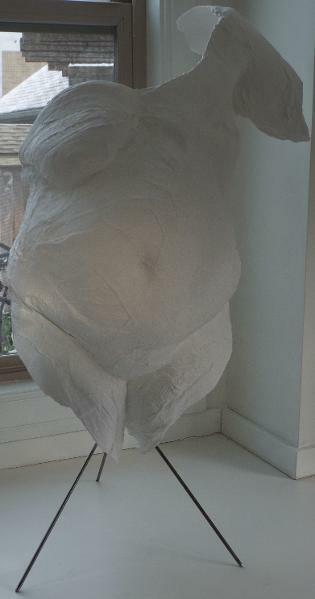 Nane's MA pose - n.d.
Holding my breasts and standing at my altar, I become aware of my own innate nourishing capacities. These breast have been gifts of nourishment for my daughters, connector of myself to them, and to the peace of giving life. Yet they represent all human kind from our mothering source and force of life. How far and wide we need to go with this, to offer our breasts of loving-kindness once again, without diminishment of the absolute power of love.The milk of mother/MA remembered through and beyond such torturous losses. Barbara's MA pose walk, December 5, 2016. I have been avoiding this pose. I am more than a week past the new moon. Today while on my walk through the forest path that runs around, the now drained of water campus lake I feel the urge to enter my MA pose in the woods with the support of a tree. It takes me a bit to settle on a particular tree and I stand facing her with my hands cupping my naked breasts under the many layers of clothes I am wearing. I rest my forehead against the tree. My feet planted close to the base. I send my roots down and they intertwine with the tree’s roots. The tree roots are holding me upright while I go through the struggle of taking responsibilities for life. I feel the weight and pain of the life-giving breasts. My heart constricts and I feel dizzy and sick. The tree roots hold on to my roots tightly. Steadying me. I turn my body around to lean against the tree for support. My head reaching back to the trunk exposing my throat. I work to stay grounded but I feel drained and in pain. I have to bring my head forward so I do not feel so vulnerable. I continue to move through the pain and responsibility that weighs heavy on me. I turn my body again to face the tree resting my forehead on the bark once again. 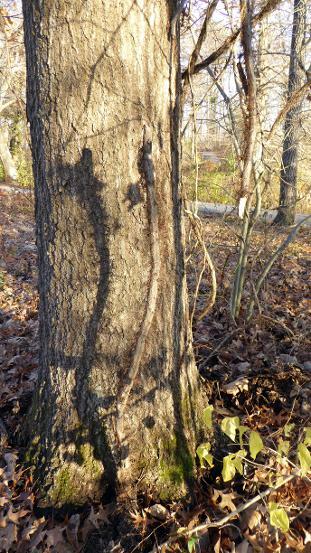 I notice vines adhered to the bark - invasive vines of various sizes traveling up and around the tree. I being to pull the vines away from the bark—breaking and twisting the vine as I do so. I pull and pull. They do not release easily. When I reach the base of the tree I find the vine wrapped tightly around it. I unravel the vine and then start on another vine on the upper bark and repeat my task until all of the imposing vines are severed from the tree. Broken vines now dangle loosely in their ruptured state. A small gesture of assistance on my part, liberating this one tree among many from the strangle hold the vines had on it. A momentary piece of liberation work for the day from parasitic invasive forces. The compression in my chest has loosened, its strangle hold on my heart released. A dear friend from Vancouver was visiting me in my home at the time of the November dark moon. Our friendship goes back to the months prior to my breast cancer surgery in the fall of 1992. Her role at that time helped me create the foundation of a circle of support from women of all ages and stages in life, all of them two breasted, as I was going through the loss of my left breast. During my friend’s visit I was completing a conceptual art piece that spoke to the concept of the abjection of women with breast cancer. We walked together by the K’ómoks estuary, a place of deep nourishment that feeds thousands of salmon migrating from the Pacific up the rivers for the annual spawn. These salmon abundant beyond imagination in years past, were one of the major sources of nourishment for the first peoples of this land supporting an estimated population of ten thousand. 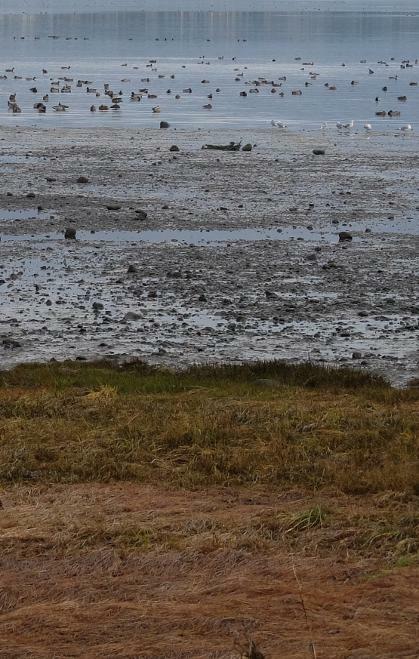 The November scene at the estuary, post salmon run, is full of shorebirds, gulls, swans, and eagles, all of whom in turn gain their nourishment from the waters and the mudflats of this crucible of life. As a breast feeds a baby, so mother earth in all her abundance feeds the many beings she holds upon her breast as they live, move and raise their families. In winter the flocks of swans gather in this rich arena of salt and fresh waters to raise their young ready for the great migration North for the summer. In walking with my friend, I was aware that we were strengthening the web of connection that has held us these many years. Each of us have faced many life challenges, and through all we have made sacred a bond of sisterhood now becoming stronger deeper and ever more nourishing as we move through our crone years. This website is the property of Gestare Art Collective 2018. All rights reserved.